Radicular Cyst is the most common odontogenic cystic lesion of inflammatory origin. It is also known as Periapical Cyst, Apical Periodontal Cyst, Root End Cyst or Dental Cyst. It arises from epithelial residues in periodontal ligament as a result of inflammation. The inflammation usually follows death of dental pulp. Radicular cysts are found at root apices of involved teeth. These cysts may persists even after extraction of offending tooth, such cysts are called Residual Cysts. It is defined as an odontogenic cyst of Inflammatory origin that is preceeded by a chronic periapical granuloma & stimulation of cell rests of malaseez present in the periodontal membrane. 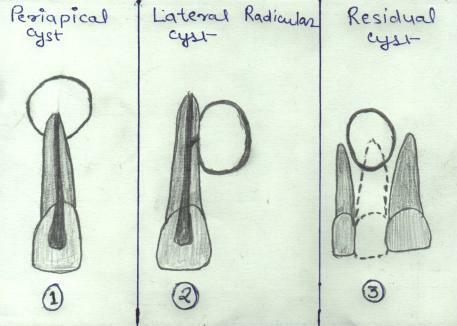 1) Periapical Cyst:- These are the radicular cysts which are present at root apex. 2) Lateral Radicular Cyst:- These are the radicular cysts which are present at the opening of lateral accessory root canals of offending tooth. 3) Residual Cyst:- These are the radicular cysts which remains even after extraction of offending tooth.